Falling for You StampTV kit!!!! Isn't is just awesome?! I SO love it!!! Look at that cute chicken!! And the frog, and the trees, and those leaves, and flowers, and yeah, everything! Ha! Well, there you have it! Hop on over to the other Design Team member's blogs to check out the inspiration they have created for you! These are beautiful Janice!! Love the branches as the background in the second one, especially! Love both of your card creations. Your first is so fun. These chickens are adorable! Great paper choices too! Perfect whimsical cards! How fun! Love both the cards. I haven't tried the mirror image technique but have wanted to. You did a great job. I love both cards. I need to practice the mirror image - I've got to learn to not be a perfectionist! Really like the branches in the background with the flowers. Clever! Absolutely lovely! Love how you pieced the chicken. Both cards are so stunning and the coloring and DP's is just amazing. Gorgeous cards. Love the beautiful colors on both. Fabulous kit. VERY nice cards! Love them both! Love your cards...and the stamp set!! These cards are both cute! I love your chicken card!!! Wonderful cards. Your first one is too fun. What great cards...but I sure do love that rooster. Love that chicken card! And the flowers are lovely on your second card too! TFS! OMG such wonderful card. I so much love the design at the first one that I sit here and smile. Love both of your cards, thank you for sharing them and the chance to win. That chicken is just too cute! And your card is delightful. Also really like the whimsical flowers! Fabulous cards, Janice and I DO love that chicken!!! Love them both... I'm going to have to try the mirror image technique. Sooo cute. Janice both are cards are delightful! And each so different, such talent! The sentiment on the first card gave me a chuckle and the second card is very pretty! Love this new stamp set from Gina K Designs!!! These are really pretty Janice - I love your paper piecing of the chickens and the gingham ribbon in the kit goes with it so nicely. Your floral card is so elegant - I love how you used the tree branch image to create a background pattern too! Amazing cards! What a lot of fussy cutting on the first one. I'm glad you used the flower image on the second one. Hardly anyone has used that one and it's my favorite from that set. Great work! Janice both cards are so cute! Thanks for inspiration! Giovana's card made me smile but your chicken card definitely made me LOL. Great colors too. The second card is so pretty. Thanks for sharing. 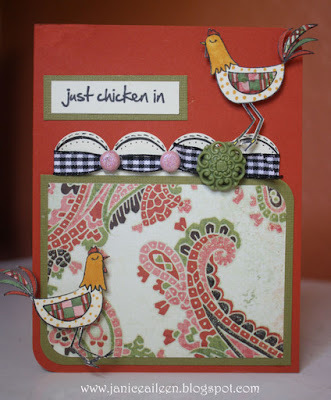 Janice, Love the chicken card and the paper is gorgeous and your whimsy card is very creative. Great work! I would not have thought of using the branch stamp for a background. Very clever. Beautiful cards. These are both fantastic cards! Love how you paper pieced hat funny chicken and made sort of a fence from the scallops. Love your funky chicken card and your cute flower card. Love the bling and the quote on your blog header. Cute cards, Janice. - thanks for sharing! Just bought the StampTV kit - can't wait! Enjoyed looking and finding inspiration from you GinaK ladies! I just love that chicken image. You used it so nicely. Great colors! I really like the combination of paper patterns you did. Both cards are beautiful. The chickens are so cute withe the paper piecing. Pretty flowers and love the chickens! Beautiful, Janice! Love love love the second card! Love the pretty flowers...I see them as butterflies too. The chicken card is my favorite Janice....Great job! Awesome cards Janice! Wonderful designs! Great cards! The chicks are so cute, & I love your ribbon treatment! What a wonderful chicken card! Love the patterned paper and having two chickens. I am not familiar with the mirror stamp technique, is there a place to find the directions for this technique? Can't go wrong with birds and trees!!! My favorite!!! Thanks for sharing these awesome cards! Heehee! Too cute...how fun is that chicken!! Great cards! Love the mirror stamped chickens, I've been meaning to try that technique out, maybe I'll do it now! Adorable cards! Thanks for a fun blog hop!